Palm reading, or palmistry as it is also known, has been practiced for thousands of years all around the world and with many cultural variations. Palmists look at the lines of a person’s hand to learn a number of things about them, such as their state of mind, emotions, and career path. Palmistry predictions are more a type of fortune-telling than anything else. 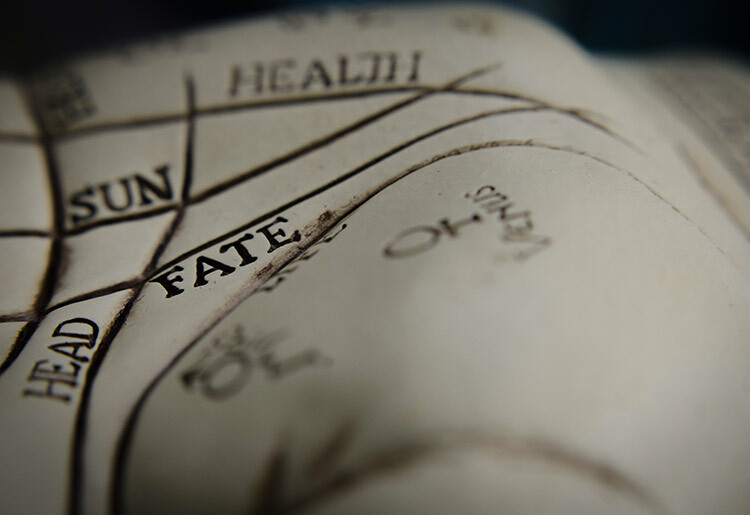 Most conventional palm readers don’t claim to be able to predict events down to specifics such as the date a person will die – but the popular belief that they do might be partly to blame for people’s skepticism. At the end of the day, it’s up to each person to decide for themselves whether or not they believe in palm reading. 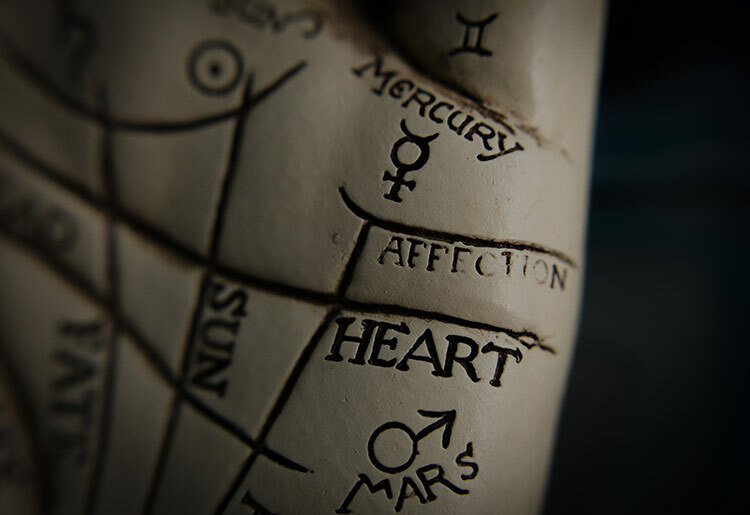 Either way, it can be really interesting to have someone examine your palms to predict what your future holds. To a trained palm reader, our hands tell a story. Look at your palms and you can see the 4 main lines and smaller, minor lines that make up a road map of sorts for the palm reader. The major lines are called the head line, heart line, life line, and fate line. They form a Rosetta Stone of sorts, which a palm reader can trace to tell a story about who you are. First things first though, a palm reader will have to know which is the so-called “dominant hand” and which is the “passive hand.” In palmistry, it is believed that your dominant hand is your “active hand” and your non-dominant one is your “passive hand.” Your passive hand shows your inherited traits, while the dominant hand indicates the changes that have happened to this baseline since your life began. Confused? We’ll give you a hand. The head line, also known as the wisdom line, is the pronounced line running horizontally across the middle of your palm. This line is said to show your state of mind and where your brain is at. Palm readers believe that people with deeper head lines are more focused and able to handle complex ideas. If the line is faint, the person is assumed to be more prone to daydreaming. Trace the head line and see how long and deep it is. The conventional wisdom goes that people with more interests tend to have longer head lines. Also check the end of the line - if it splits, you may be someone who tends to vacillate and have trouble making decisions. The heart line is the horizontal line at the top of the palm, and it reflects on a person’s emotions. 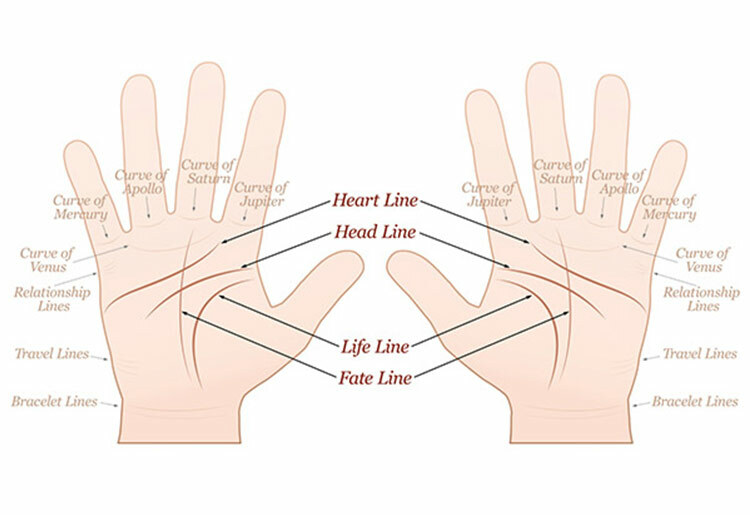 Palm readers believe that the straighter the line, the more likely the person is to express their emotions inwardly; the curvier the line, the more the person expresses their emotions outwardly. A faint line or the lack of a heart line is believed to indicate that someone is less driven by emotion. It is also believed that a broken heart line can signal emotional trauma. Trace the heart line slowly and surely to see how straight and pronounced it is. See where it begins and ends. Many believe that a heart line that starts below the index finger indicates that someone doesn’t fall in love easily, while one that begins in the middle of the palm is believed to be a sign of someone whose heart takes flight more readily. The life line starts at the base of the thumb and index finger, and curves downward to where the base of the thumb meets the wrist. Many believe this line only indicates how long you’ll live, but it’s actually believed to reflect your energy, vitality, and the fervor with which you live your life. This one is a bit more simple. The main attribute to look for here is the length. Trace the beginning of the life line from the base of your thumb down to your wrist, seeing how long it is. The fate line is not universal, so don’t freak out if you can’t find one. This line runs north-south from the base of the palm up to the middle of the palm. This line is believe to reveal how much success you’ll enjoy in life. Many palm readers believe that a line with many breaks indicates a person who will go through a number of changes during their career. 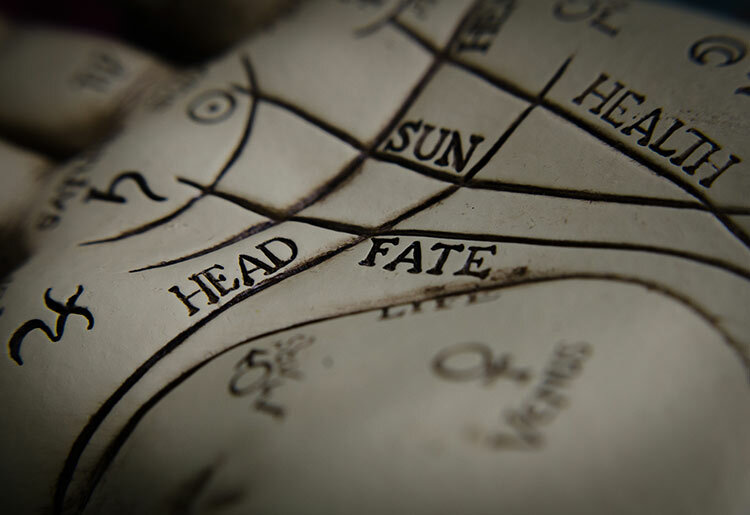 Check whether or not you have a fate line. It’s possible you don’t. Then you’re going to want to see how pronounced it is, how long it runs, and to what extent it is broken or not. Some palmists extend their readings to other lines of the palm, such as the health line, marriage line, money line, and travel line. The health line is also be known as the unhealthy line, as most people who have this line are not healthy enough. Still, the appearance of the health line doesn’t necessarily mean its connected to bad health. The health line can be found under the heart line and ends without connecting to the life line. Located above the heart line, the marriage line reflects your openness to love and your current relationship status. Also known as the relationship or affection line, you may have one or more of these lines with varying lengths. If you’re wondering what your financial future holds, the money line can give you a lot of insight. Most people have multiple money lines, upright lines that can be found under your ring and pinky fingers. Deep and clear money lines mean you’re a clever investor and could become rich while a wavy line indicates financial instability. The travel lines can be read to determine how often the opportunity to travel or live abroad will arise. The shape, length and amount of travel lines are all indicating features. Found on the lower half of the life line, travel lines can be horizontal or vertical and start at the edge of your palm. Other palm readers look to the “mounts” under each finger, which are named for Jupiter, Saturn, Apollo, Mercury, and Venus, and to the Mount of Moon and Plain of Mars. All of these signify different aspects of a person’s fortune. For example, the Mount of Jupiter can tell a lot about a person’s ambitions, self-confidence, and social status. The Mount of Saturn is all about wisdom, love and philosophy. The Mount of Apollo (also known at the Mount of Sun) is related to fame, luck, and the arts. The Mount of Mercury is associated with business and communication skills. And the Mount of Venus signifies beauty, love, and sensuality. The old cliché about getting what you pay for is just as true for palm readings as it is for anything else. You should be skeptical about any website offering free readings, as the advisors are likely to be uncertified and to be giving readings for fun or as a hobby rather than out of any actual knowledge of the different lines and contours of the palm and what they all mean. On the other hand, palm readers on paid sites are typically certified via an interview and screening process. 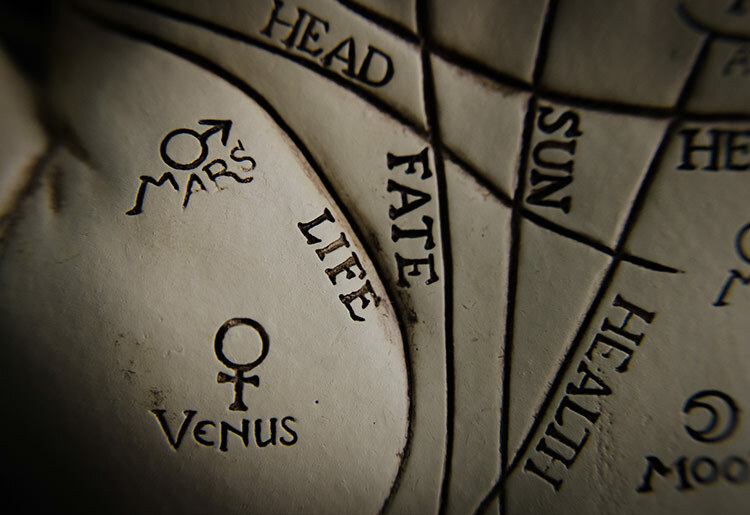 Psychic reading websites like Kasamba offer online palm reading services so you can learn more about your future from the comfort of your home. Kasamba’s advisors offer services in dozens of categories, including palm readings. Its real-time chat platform allows you to see and speak with your palmist, giving off the feel of meeting them in person. Most importantly, the video chat function allows you to show them your palms. You get 3 minutes free and 50% off your full session whenever you try a new palm reader on Kasamba. Advisors are available to make your palm reading predictions 24/7, 365 days a year.